BOTH MY NEW BOOKS ARE UP AND RUNNING ON AMAZON! WAHOO! 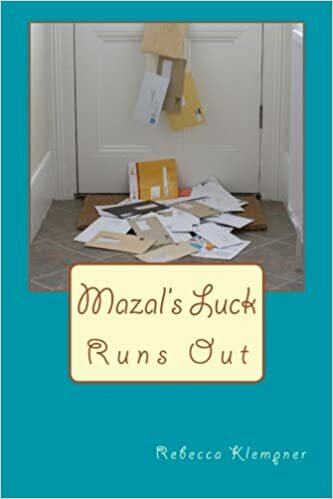 Mazal’s Luck Runs Out is for ages 8-11. My life is being taken over by marketing (What? Did you say there’s a Jewish holiday coming? More than one? You mean I have to cook, too? ARGH!). Also, I’m working on no budget here, but at least people can actually buy both Mazal’s Luck Runs Out and Sliding Doors and other stories online now. So, just as I gave up on blogging about books during summer break, my husband mentioned something tonight so post-worthy, that I just had to share. I’m very excited to be visiting one of the local day schools tomorrow. For a change, I won’t be doing a read-aloud of Raizy. Raizy may not even come up, due to the age of the kids involved. Instead I’ll be talking about “Storytelling,” to coincide with the current unit the students are studying in school. Breaking down storytelling in forty-five minutes will be challenging, especially at the upper-elementary school level. After a little intro, I plan on making an extended metaphor connecting storytellers to fishermen. I’m hoping it will be both instructive and age-appropriate. I’ve spent quite a bit of time preparing and concocted a whole series of visuals, and the like. How is a good storyteller like a fisherman? Last week’s Hamodia/Inyan Magazine had an article by one of my favorite columnists, Rabbi Fishel Schachter entitled “Guided by Tale Winds.” While today Rabbi Schachter is well-known in the Torah world for essays and presentations for adults about the weekly Torah portion, parenting, and other subjects, he first gained popularity as a rebbi and storyteller to students in Jewish day schools. Rabbi Schachter explains in the article that one of the adults in his audience told him many years ago that he had to choose between teaching grown-ups or kids — and he indicated that the natural choice for a man of Rabbi Schachter’s talent and intelligence was to teach adults. Turning to his own rebbi for guidance, Rabbi Schachter asked if teaching kids was really beneath him? Were all the silly voices and so on undermining his stature? I recently conversed via email with the enormously popular author, Tamar Ansh, about her new cookbook. Let My Children Cook! is her first cookbook for kids, and it tackles a particularly pertinent area of Kosher cuisine for this time of year: Passover. Tamar Ansh’s latest cookbook, out in time for Passover! 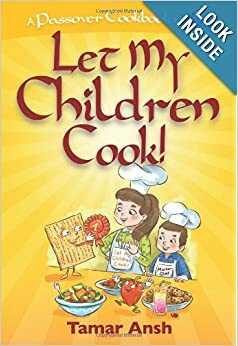 What made you want to write a cookbook for children this time? And why specifically one for Passover? While she does make one point I agree with, that awards committee’s tend to favor Jewish picture books with male lead characters and that the females tend to be engaged in traditional roles, she seems to learn from that that Jewish children’s books as a whole have a problem. I have to disagree with the overall picture Sigalow paints, though. You can see my comments on the article if you visit Tablet (scroll to the bottom of the page), but I’d like to make a few more thoughts.